With the World Series all wrapped up, it is now time to look towards the 2019 baseball season. Next summer, the Ems will be back with an action-packed season featuring 38 home games, beginning with Opening Night on June 14th, 2019, against their Northwest League rivals, the Hillsboro Hops. Eugene begins the summer with a quick slate of home games on June 14th, followed by Saturday June 15th and Father's Day on June 16th. The Ems will also host their annual Independence Day celebration on July 4th, which begins a 5-game homestand, ending on Monday, July 8th. In all, the schedule features 7 Fridays and 5 Saturdays, with a packed month of August, highlighted by 17 games in the month alone. "2018 was a special year for our club, winning the championship and MacPhail Award," said Allan Benavides, General Manager of the team. "We're looking forward to building off of this tremendous momentum and bringing all of our fans a fantastic 2019 season." 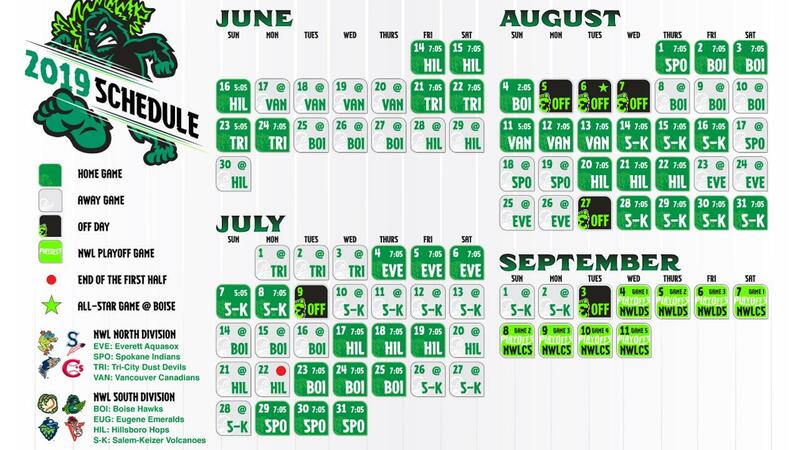 To view, download a printable version or save the schedule to your mobile device Click Here.